Our garden is ablaze in color today! Happy Thanksgiving to you and yours! I believe in nearly all things except impossibilities. Gratitude is one of those ‘graces’ of the spirit, which once we find it, transforms the quality of our existence. I’ve learned it is more an attitude, a habit of mind; which colors each day with openness to what unfolds. We can find the workings of good fortune and infinite love in the midst of our lives, even as we face the challenges each new day brings. It is in working through our challenges that our lives grow, in often unexpected ways. It is usually in the shadows of our day to day struggles that we come to understand the truth of friendship and loyalty; the self-less love which binds families; and the miraculous nature of our multiverse. 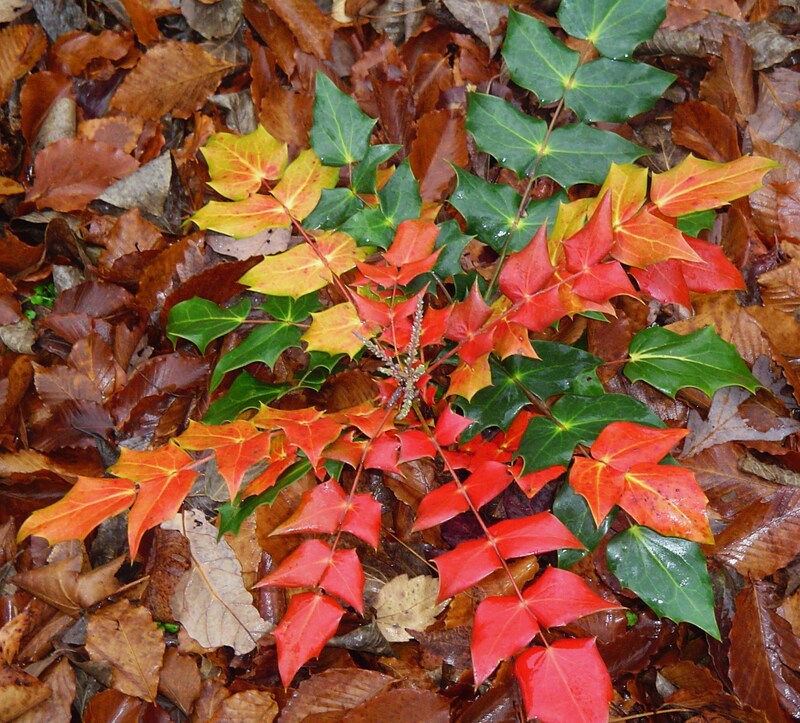 “Gratitude” is the theme of our A Forest Garden 2016 calendar, just off to the publisher on Monday. It is filled with photos celebrating the beauty of our garden as the seasons unfold. And each month offers a new quotation about the power of gratitude and appreciation to shape our lives and transform our world. I wish each of you happiness and warmth on this new Thanksgiving Day. May each of us find joy in the day, wherever we may be, and with whomever we share the holiday this year. And may each passing year bring us closer to living in the grace of gratitude. May we realize the power of a grateful mind and heart to fill our lives with joy. Thanksgiving morning has dawned clear, bright and cold here in Williamsburg. A simply beautiful day, and a good day for traveling; which is very welcome news since our Thanksgiving dinner is already in preparation by loving hands…. elsewhere. We have a pecan pie, some rolls, and of course some beautiful cranberry grape preserves to contribute to the feast. I want to share a few photos of our mantlepiece arrangement, completed last evening. This grows and changes a bit each year, and will probably change a bit more before the end of December. 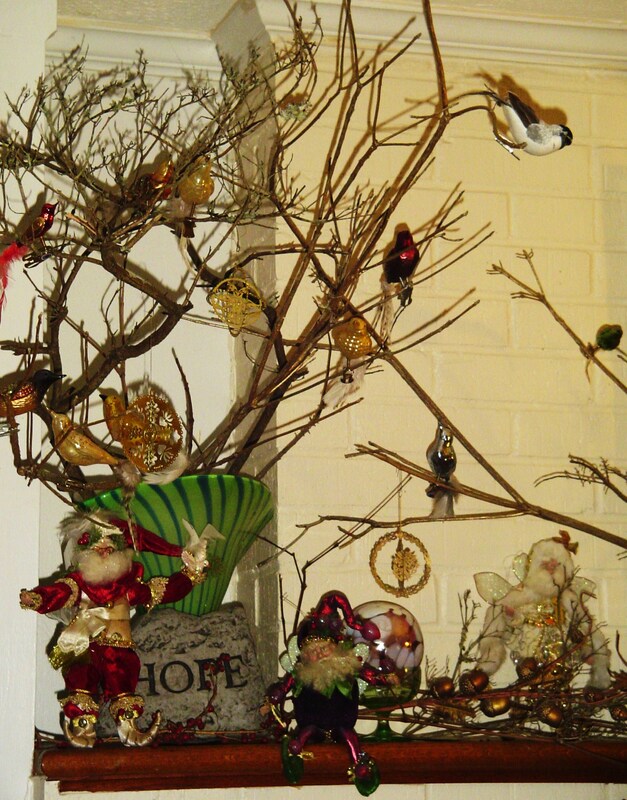 This is the simplest of arrangements, depending on branches from the garden and items collected over the years. 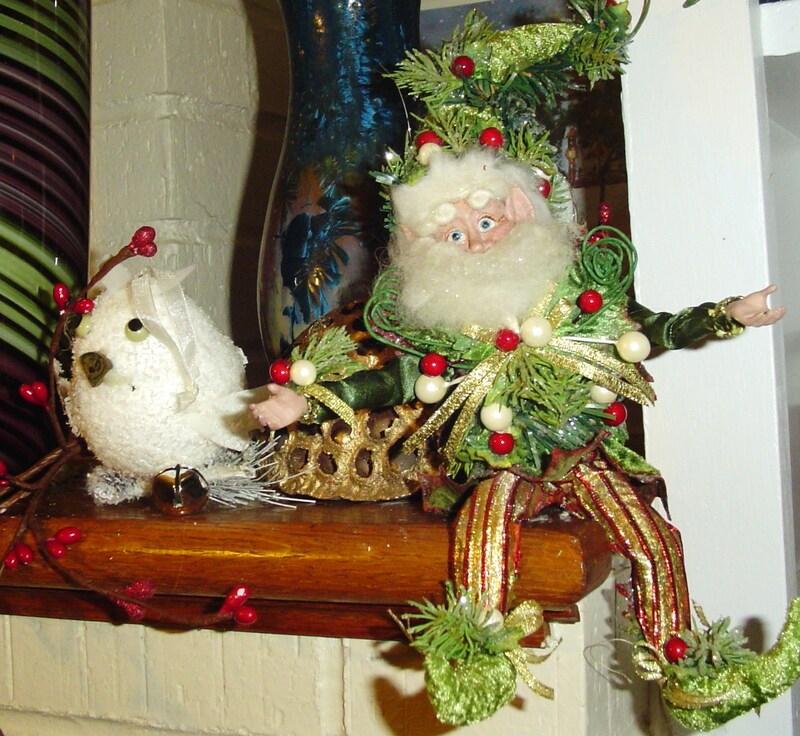 The birds came from McDonald Garden Center in Virginia Beach. They have such wonderfully imaginative displays. The fairies, designed by Mark Roberts, were another McDonald Garden Center find. This is our indoor forest garden, which we’ll enjoy from now until early spring. Our very best wishes to you as we greet the season of the solstice, the season of light, preparing for Yule, Hanukkah, and Christmas. Some of the glass orbs are from Glass Eye Studio, hand blown with ash from Mt. Saint Helens in Washington. Others were hand blown in Portugal. It is ironic that on this Wednesday before Thanksgiving, the day for making preparations, both practical and mental for Thanksgiving tomorrow; we here in the United States confront prompt after prompt to acquire even more than we have. 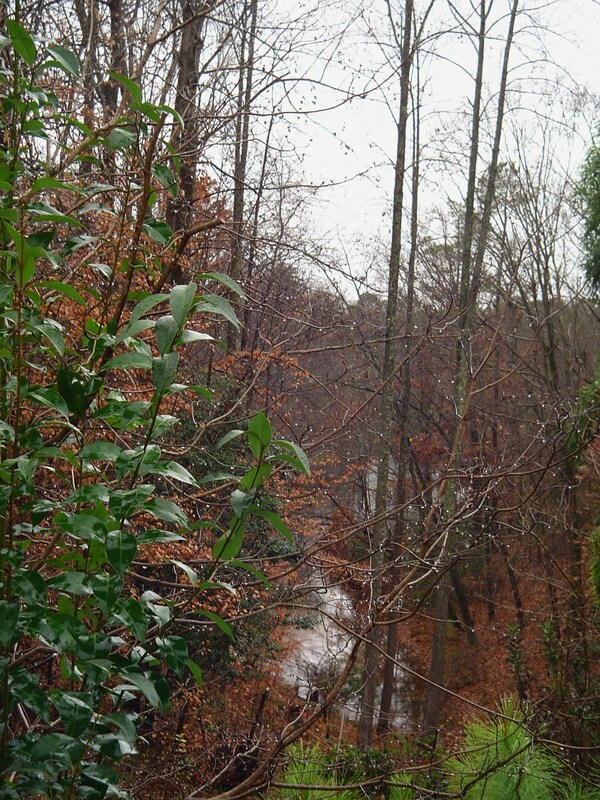 This day before Thanksgiving has been very cold and wet. It is an interesting truth that so often those who are richly blessed with all things material focus on wanting more and more, while those who have little materially are often overwhelmed with gratitude for the blessings and kindnesses already in their lives. I’m thinking not only about our plans and purchases for our special meals tomorrow, but of the looming season of acquisition that our holidays have become. And the retailers, big and small, remind us at every turn that it is our magical time of year to shop, beginning the day after Thanksgiving- or maybe on Thanksgiving day itself after dinner; or maybe even a few days early if we really want to get a jump on the “short” Christmas season. 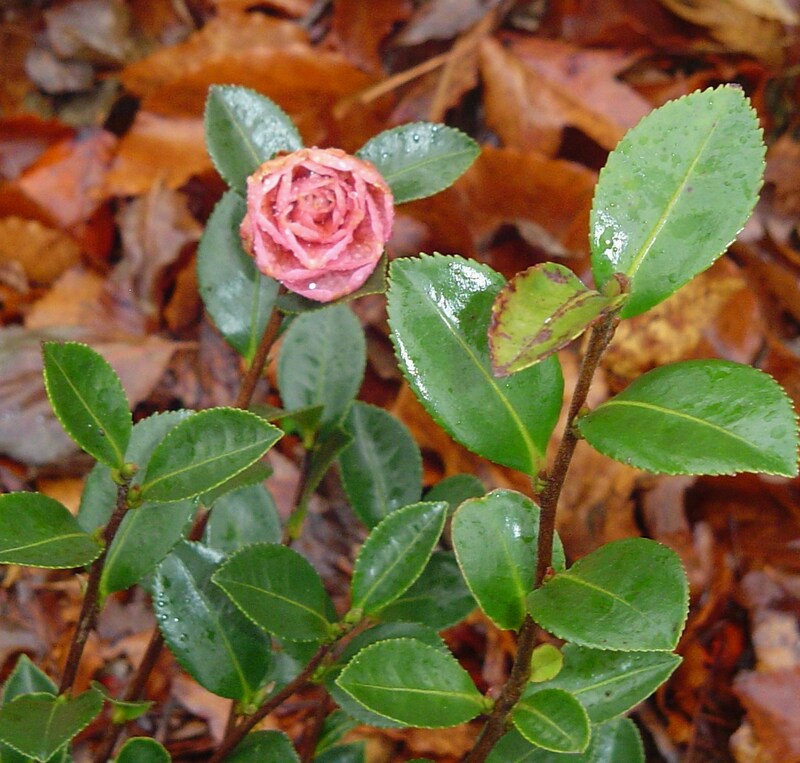 This first bud opened on the Camellia yesterday. My email “inbox” is full with offers of discounts from every retailer with whom I do business. Turning on the TV for a weather or news update brings more sales pitches into the living room. So how do we properly observe Thanksgiving? 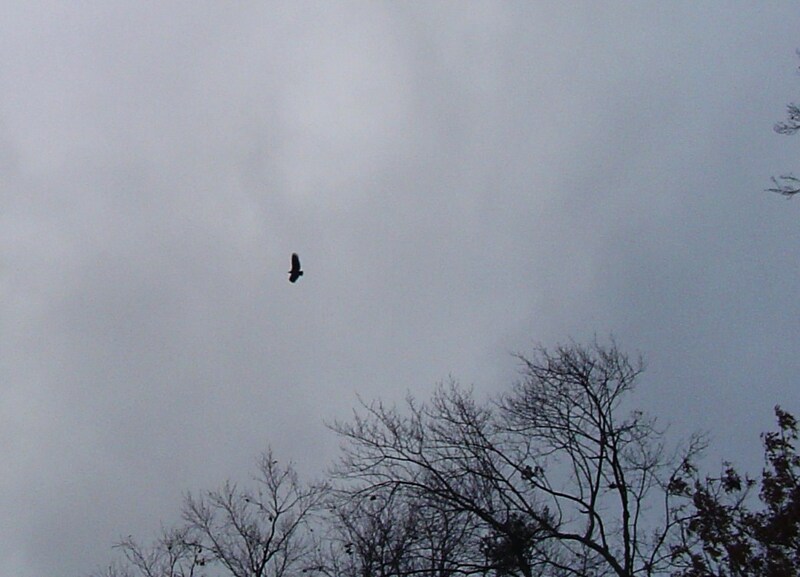 An eagle and his mate were circling over the garden when I went out for a few photos today. Is it really about the meal, as the Cooking Channel experts and grocery retailers want us to believe? Is it about reading the advertising and planning our most strategic shopping excursion to get a jump on everyone else? Is it about enjoying the deep discounts retailers offer us so we can purchase their overpriced merchandise? Perhaps there is another way. Yes, I know that around most dinner tables tomorrow there will be a pause while someone says Grace over the meal. Whether that moment is long or short, I hope we will understand that Thanksgiving is more than a day. It is a life’s work. And the point of Thanksgiving is to deeply appreciate the people, places, and opportunities we already have in our lives; not to feel compelled to acquire more. 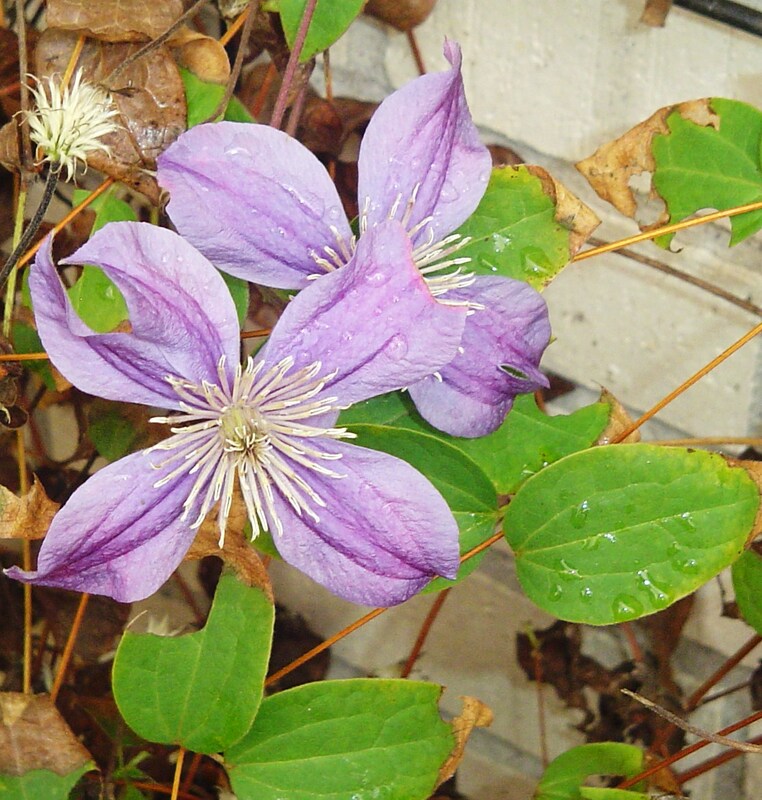 Clematis so far have survived the cold nights and continue blooming. The root of Thanksgiving for me is appreciation. Appreciation begins with mindfullness; with paying attention and understanding not only the value of a thing, but how it “fits”. We appreciate how comfortable our walking shoes are, and how they allow us to take that walk through the neighborhood. We appreciate the companionship of our cat or dog, and how they warm and brighten each day. We appreciate the friends and family who keep us company as we travel through the years. And we appreciate the memories of those who have departed from us, for whatever causes separated their path from ours. 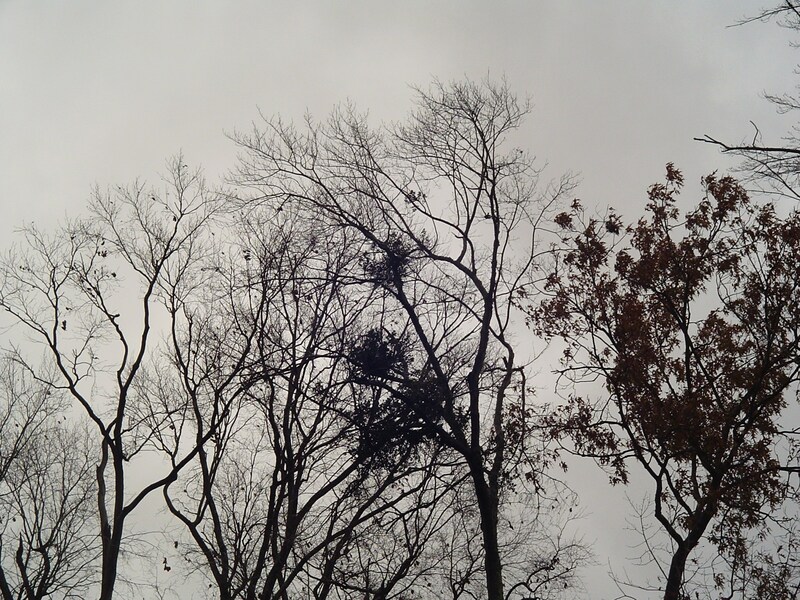 We appreciate our home, our community, the good soil in our garden, the birds who brighten the bare branches of our shrubs in winter, the hours of sunlight, the life giving rain beating on the roof as we drift off to sleep. The things we truly appreciate in our lives rarely come from a store. Things which bring us the deepest happiness are priceless, and never go on sale. 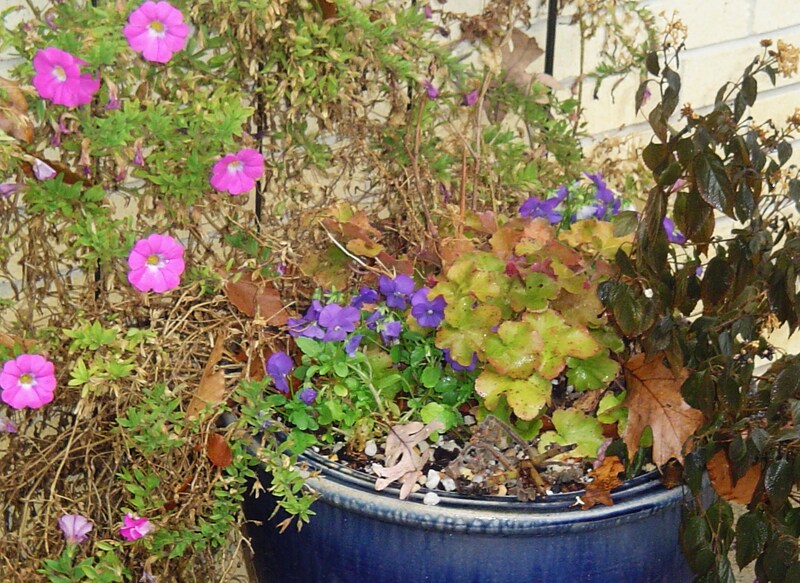 The petunias are still blooming, despite our nights in the 20s. The Lantana is bitten by the frost, buy I hope the roots make it through until spring. This is an understanding it often takes decades to grow into. What a kindness to help our children realize early on that the gifts don’t bring happiness. There is more to life than shopping. Theodore Geisel tried to share this little lesson with his, “The Grinch Who Stole Christmas.” Perhaps some of us got it at the time, some of us couldn’t get past our compulsion to head to the mall. I am taking a deep breath and stepping back from the madness of the retail world this Thanksgiving, as a conscious act of gratitude for what I have. Rather than become distracted by the frantic need to “get it all done” and “get there on time,” I plan to stay at home and appreciate the peace and quiet of our garden. I want to cook, listen to music, read, correspond with friends, and spend time with loved ones. Our sky as the storm blows over us today. There are still gifts to purchase, cards to send, packages to mail; but they can wait until after Thanksgiving. 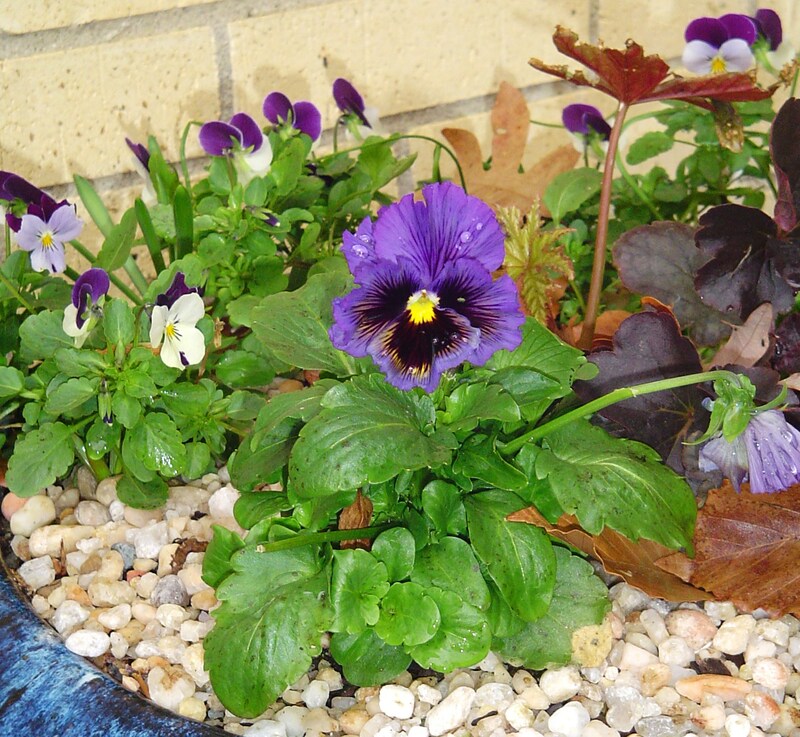 Violas have such happy faces…. Let’s live in the present moment and savor the beauty around us, satisfied, and grateful; and enjoying the deep peace which only lives in a grateful heart.